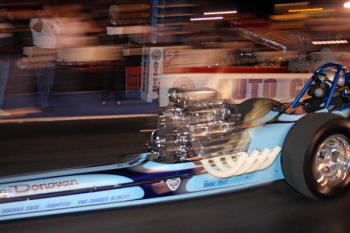 Since it’s beginnings approximately 2000, dedicated individuals would restore or recreate historic Top Fuel dragsters to be fully functional, to come alive, not just sit quietly in a museum. 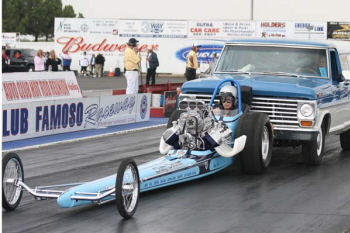 It was decided that the 2000 California Hot Rod Reunion would be a good place to show them off. 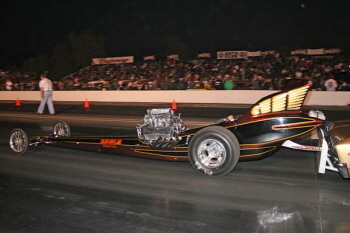 The term “Cacklefest” was coined because of the cackle sound nitro burning dragsters make when they are running. 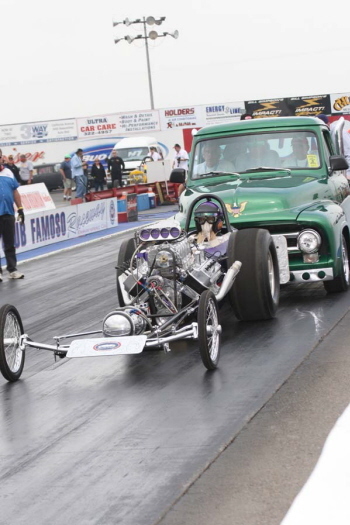 “Cacklefest” has become one of the most alluring words in drag racing’s vocabulary. 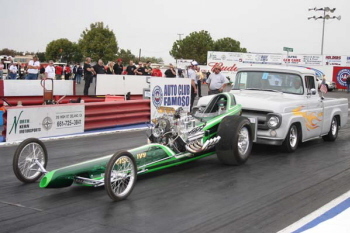 Most importantly it is exposing the core of drag racing history to thousands of fans who were not even born the last time one of these cars were push-started or went down a drag strip. 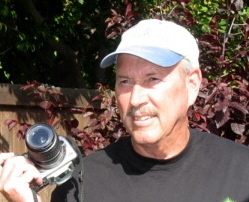 For more info go to Cacklefest.com. 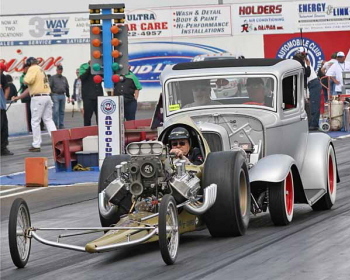 The Cacklefest portion of the 16th Annual Auto Club of Sourthern California Hot Rod Reunion, presented by Holley, took place on Saturday evening. 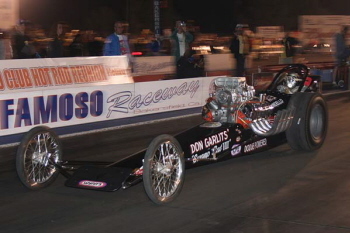 After the last runs of Top Fuel had gone down the track and sunset began to change the mood of the event, the approximately 75 Cacklefest cars were being staged for their parade in front of the packed grandstands. 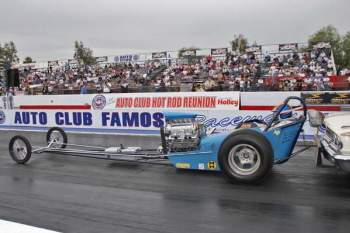 The cars are then pushed to be started down the “Return” road in front of the grandstands where fans are 4-6 deep along the fence waiting for a chance to be as close as possible to a loud cackling dragster and smell the NITRO! 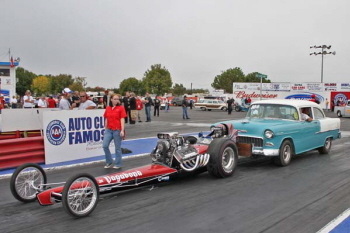 The cars then make a turn in the staging area and with fire breathing from their headers, head down the left lane of the track to be parked at the far end of the quarter mile strip. 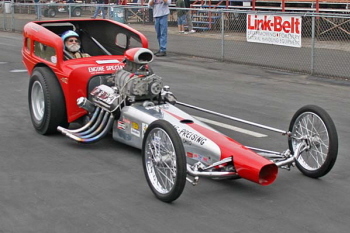 There they continue to breath fire until they have to shut them off. 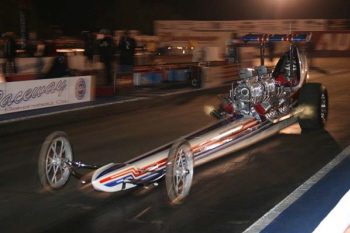 To anybody who likes motorsports this is an experience not be missed. 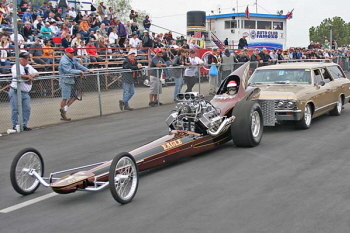 Some of the Cacklefest cars included in what could be called this “Living Museum” were; Dead End Kids, Weiss & Larkin, Geo Bolthoff, Frantic Four, Speed Sport, Stellings & Hampshire, Swamp Rat III, Swamp Rat VIII, Paradise Alley, Ernie’s Camera, Childs& Albert, BankAmericar, Poison Ivy, Syndicate, Jerry Ruth, Poachers, Assassin, Warren-Coburn & Miller, Creitz & Donovan, Magicar, Beebe & Mulligan, Kuhl & Olson, Howard Cams Rattler, Wynn’s Spoiler, Smirnoff, Yeakel Plymouth, Tommy Ivo Barnstormer, Northwind, Glass Slipper, Hustler 1. 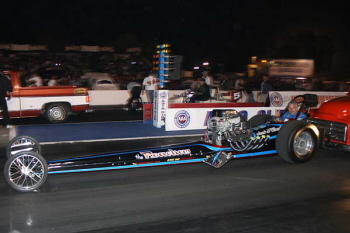 The Loukas & Priesing dragster. 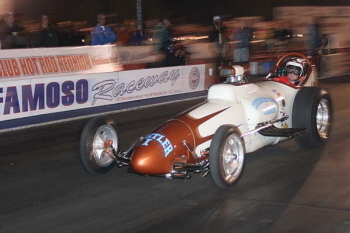 Grand Marshall Ed “The Ace” McCulloch in the recently restored, Top Fuel dragster he drove to the number one spot on Drag News in 1965, the Northwind. 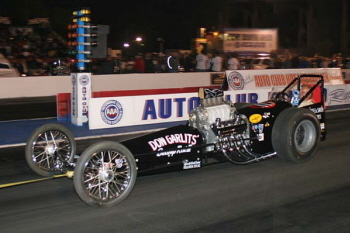 The Creitz & Donovan dragster being push-started. 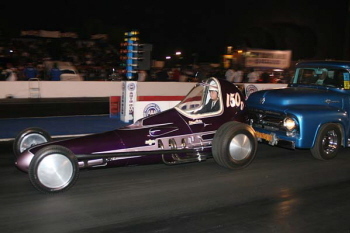 The newly restored Yeakle Plymouth dragster being push-started. 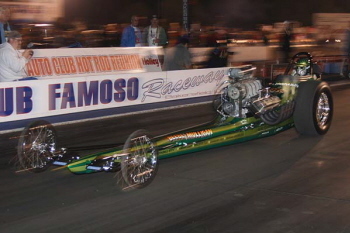 The Eagle Electric dragster being push-started. 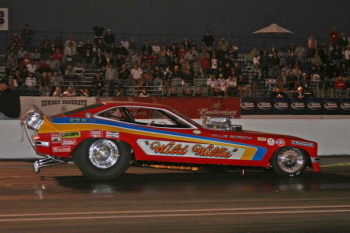 The debut of the Wild Willie Borsch Funny Car. 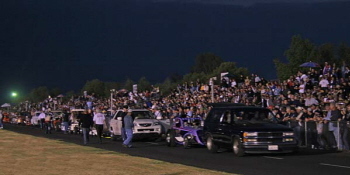 The Cacklefest cars were being staged for their parade in front of the packed grandstands. 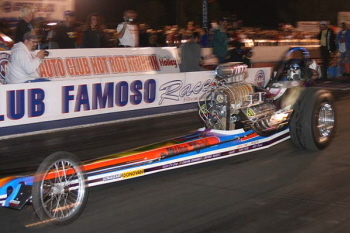 “TV Tommy” Ivo enjoying his Barnstormer. 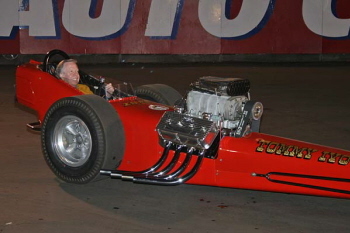 The Kuhl & Olson dragster with Honoree Carl Olson driving. 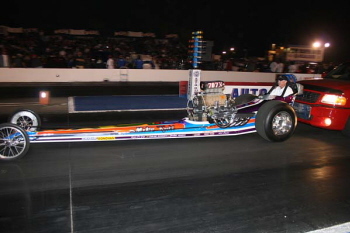 Walt Stevens handling the “Poachers” AA/Fuel Dragster. 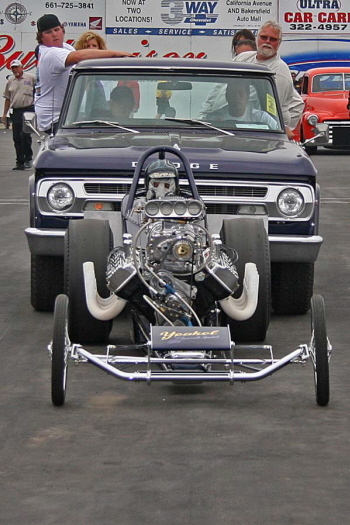 The twin engined Syndicate is Cackling. 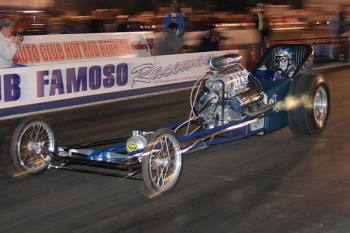 The Iron Horse showing some flame. Creitz & Donovan is Cackling. Safford, Gaide & Ratican has some flames. 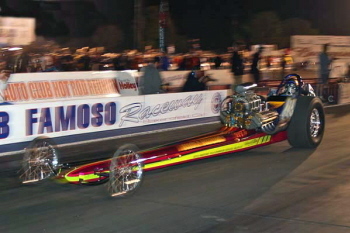 The Beebe & Mulligan dragster has the candles lit. 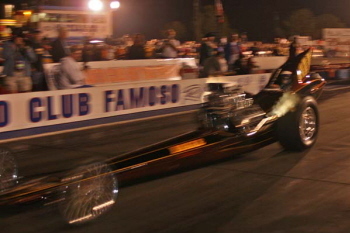 The Eagle Electric dragster appears like a fire breathing bird in the darkness. 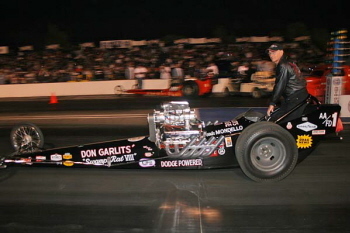 Traditionally the last car down the track is “Hustler I” with legendary Art Chrisman doing the driving.